The IR 3.4 handpiece is ideal for skin tightening and rejuvenation of small and delicate areas such as the face and décolleté. The handpiece emits a long wavelength of 850 – 1750nm and has a spot size of 3.4 cm2. You can choose from three types of pulses- mild, medium and intense for a total fluence delivery of up to 50 J/cm2. The handpiece is equipped with a built-in Sapphire contact cooling tip to protect the epidermis and ensure a pleasant treatment experience. The pulse parameter consists of three stages: pre-treatment cooling of the epidermis, pulse delivery (4-6 seconds), and post-treatment cooling. 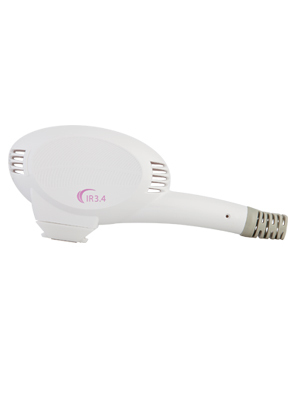 The ergonomically designed handpiece can be used on skin types I-V.